The indie game scene on just about every system has been getting a truly massive amount of side-scrollers in the last few years. So many games have come out for this genre that any new games will have a very hard time standing out. Taking that into consideration, as well as the fact that the game has zombies, means that Guns, Gore & Cannoli could be easily overlooked. However, the combination of the setting, frantic gameplay, and amusing visuals means that overlooking this game would be a big mistake. One of the best parts about Guns, Gore, & Cannoli is the way that the game really pushes for the 1920’s feel in all of the visuals. This means that all of the enemies will be appearing in period-authentic clothing. For example, you can expect to see football players rushing you that are wearing the old-school leather skullcap/helmets from that time period, and women zombies wearing all of the clothing that you would expect from housewives of that era. Another area where the visuals are great is the variety when it comes to the enemies. Not only will you be facing off with reanimated police officers, World War I soldiers, football players, butchers, coopers, housewives, waitresses, etc, but you will also find yourself fighting a wide-range of thugs as well. These thugs will range from professional looking hitmen to thugs with baseball bats that are wearing white tank tops like those you would see in an old mafia movie. The visuals are also quite vibrant and colorful, which really jumps out once the explosions and hail of blood and body parts begin. One issue that can often come up with these types of games it that they can begin to stutter and slowdown as the action picks up and lots of enemies show up on screen, but this never happens with Guns, Gore, & Cannoli. You can expect a silky smooth gameplay experience throughout the experience. The sound in this game is also very good, especially the sound made by all of the different weapons. If I had to criticize any part of the sound, it would be the main character. The voice actor does a fine job of creating a voice for the protagonist, but the number of lines that the character says while running through the levels are limited so they can get old very fast. All of the great visuals would be next to useless if the game were not fun to play, and thankfully, Guns, Gore, & Cannoli is fantastically fun. One of the reasons for this is that there are a wide range of weapons at your disposal that all feel necessary at times. For example, while the tommy gun is a great way to cut down huge swathes of zombies, it aims for the center of the enemy’s body when fired. This means that the tommy gun does not work all that well once enemies with chest armor or that are wearing sandwich boards show up, at which point you are better off switching to one of the two pistols in the game that aim for the head. The enemies are also varied enough that you will need to watch out for multiple types of attacks. While most of the zombies will rush you and attempt to knock you down or hit you with melee attacks, as the game progresses you will have to watch out for poison attacks, exploding enemies, zombies with a variety of firearms, and even Leprechauns attached to balloons that will drop explosives on you. Guns, Gore, & Cannoli can get a bit difficult at times, but nothing that will become frustrating. In the event that you do want a bit of help getting through the game, the game supports up to four player co-op. One of the refreshing parts about playing this game is that your protagonist, Vinnie the enforcer, does not really seem to care about the ongoing zombie apocalypse. All he really wants to do is find the guy he was sent to find and take him back to his employers. You are not going to find a story about curing the zombie plague, finding out what caused it, etc, which is quite nice since it seems like most games focus on that once once the zombies show up. 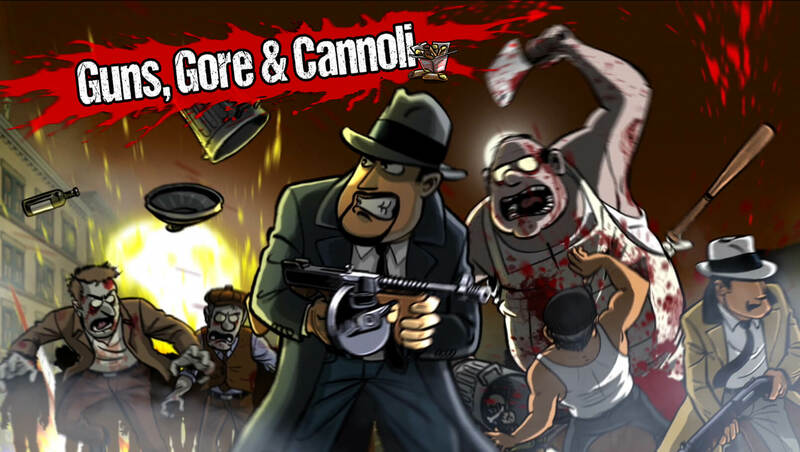 Guns, Gore & Cannoli does a good job of setting itself apart from both the other zombie games and side-scrollers on the market. The great art style and fun, fast gameplay make this a must have for any 2-D shooting fans out there. Do you agree with our score? Anything that you particularly liked or disliked about the game? Let us know in the comments below.